And what do you know about Gerberas? One of the most beautiful flowers, which enjoys extraordinary popularity among a number of pets in girls, is undoubtedly the gerbera. Gerbera belongs to the family of the Astrope. It is this flower that has lasted for many years and therefore blooms throughout the year. The plant received its name from the name of the famous German physician and botanist F. Gerber. To date, we know about 80 kinds of wonderful gerbera. In natural conditions, it can be found in India, in southern Africa, Madagascar, Japan, Australia and South America. In the vastness of our country gerberas have become known not so long ago - just from the 90s of last century. While the whole world is admiring this beautiful flower is already the 3rd century. It should be noted that the first appearance of the gerbera did not cause delight, but on the contrary, the flower seemed too simple and importunate to many. After some time, all the initial shortcomings of this flower turned into his unique virtues, which contributed to the conquest of the hearts of many ladies. Simple and at the same time perfect forms of this flower cause a special sympathy and favor. And such bright and unusual colors, large flowers and gentle pleasant aroma of caramel can not only raise the mood, but fill the room with sun and joy. It is the gerberas most associate with the sun and this is fully justified. There is an interesting legend about the appearance of this beautiful flower. She tells that for a long time there lived a beautiful forest nymph Herba, illuminating with its beauty all the neighborhoods and attracting the eyes of not only young men, but also girls. Excess of such attention tired the girl, and one day she decided to turn into a modest, unattractive flower. So there was a gerbera. 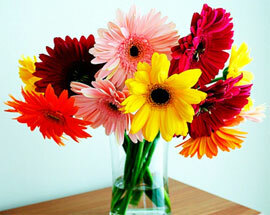 To date, gerberas occupy an honorable third place in the ranking of the best-selling flowers. Almost all flower delivery services provide year-round services in the delivery of bouquets and compositions of gerberas of various colors. Recently, the gerbera room has gained special popularity. 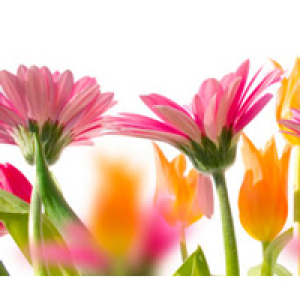 As for the meaning of this flower, it is worth saying that it is gerberas that are a symbol of modesty and innocence. Another value should be called cleanliness. That is why the bouquet of gerberas will be an ideal gift in case you want to express your admiration for something, sincere gratitude and recognition. In the language of flowers, gerberas will be an indicator of the sincerity of your feelings and the recognition of eternal love for your second half. Not for nothing is the inflorescence of gerberas compared to a solar disk surrounded by numerous and equally bright rays. This symbolism gives this flower even more creative and life-affirming meaning. Due to its bright color and sun-shaped form, this flower can be safely called the most positive. It is the gerbera for many cultures and peoples that has become a symbol of goodness, playfulness and joy. Quite often gerberas are compared with chamomile. But between these plants there is a huge difference, at least in the advantage of the color palette of gerbera. Nature has awarded these flowers with absolutely all colors and shades, except blue. But even on this issue carefully working breeders. Among the demand for flowers, the girls put gerberas on an honorable 5th place. A bouquet of gerberas will be a wonderful gift for both girls and men and will perfectly complement the main gift for your colleagues and close relatives. Remember that it's not so difficult to surprise and please your loved ones! Give joy and bring smiles with good intentions and a pure heart.